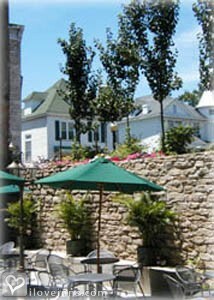 Clarksville bed and breakfast travel guide for romantic, historic and adventure b&b's. Browse through the iLoveInns.com database of Clarksville, Missouri bed and breakfasts and country inns to find detailed listings that include room rates, special deals and area activities. You can click on the 'check rates and availability' button to contact the innkeeper. The town of Clarksville in Missouri is considered one of the few unspoiled territories in the United States, with all its ancient buildings and fixtures still standing to this day. Found at the southern tip of the Little Dixie Highway of the Great River Road, Clarksville is both an unspoiled town and a progressive business district. Clarksville boasts of its spectacular views and parks. Because Clarksville is a primary river city in Missouri, thousands of visitors visit the town on a regular basis to either head down the rivers or enjoy the quiet and the peace that is rare in cities. Start the day off by visiting the Clarksville Museum and relish the rich heritage of the town. Most Clarksville bed and breakfasts are found just a few minutes away from the museum, so bringing your kids to Clarksville with you may be a great idea. By Rackheath House at Overlook Farm.